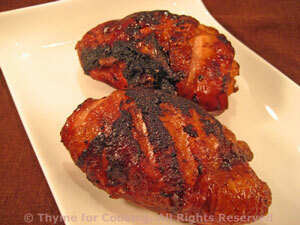 Easy Dinner from Thyme for Cooking: Barbecued Chicken Thighs. 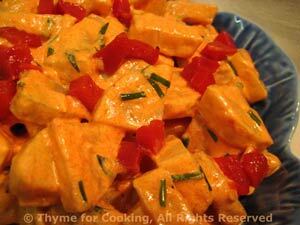 We use the rest or the Pimiento Dressing from Friday for the potato salad. You can add a bit more mayonnaise to the dressing if needed. 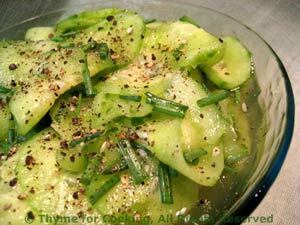 Both the potato salad and cucumber salad will be finished later in the week. Sauce: In a small saucepan gently heat all ingredients for barbecue sauce, except oil. When warm, remove half of the sauce to a bowl. Add oil to the bowl to make the basting sauce. Chicken: Rub thighs with oil and sprinkle with salt and pepper. Start basting after 10 minutes and baste 2 - 3 times. They'll be done when they are nicely browned and the juices run clear when pierced with a knife.